You are here: Home / Oregon Nursery Country / William Dillard Nursery Co. 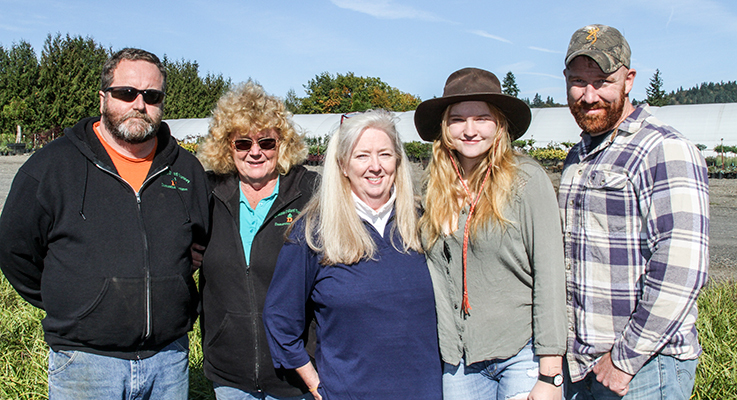 This family nursery in Damascus, Oregon, was founded over 55 years ago and spans four generations. Much has changed in the nursery industry since William Dillard Nursery Co. was founded more than 55 years ago. But as Dillard’s three children carry on the family business, the timeless lessons he taught them are still first and foremost. Don’t put all your eggs in one basket. Grow lots of items. Serve lots of customers. Offer consistent service. And ship to lots of places. The second generation of the business consists of son Michael and daughters Debra and Teri, who jointly manage it. Michael serves as president, while Debra is vice president and Teri is treasurer. The second-generation trio is being followed by a third and even a fourth generation of Dillards who will have daily involvement in the business for years to come. And they have customers who have been around almost as long as the Dillards — some for five decades. The nursery currently offers around 40 percent container plants, conifers and Japanese maples, and 60 percent field-grown trees. They also offer some native plants. “We have product that will go in lots of different regions,” Teri said. This material is shipped to re-wholesalers, independent garden centers and landscape companies that are located in some 40 states plus Canada. The opportunity to serve customers is the biggest reason why the Dillards count their blessings every day. After all, that’s what their father taught them. William Dillard came from hardscrabble beginnings in Texas, growing up the son of migrant farmworkers during the depths of the Great Depression. He met his future wife Betty in 1949. Soon after, they married and then moved to Oregon. William went to work for Dan Schmidt Nursery and, later, Glenn Handy Nursery (now known as Handy Nursery Company). It was at these nurseries that he learned how to graft woody trees and shrubs. These skills eventually allowed him to strike out on his own in the nursery business. “He was always very grateful for the help they gave him in getting started,” Teri said. In 1960, at the age of 29, he founded William Dillard Nursery Co. on five acres in rural Damascus, at the corner of Tillstrom Road and 232nd Avenue. “His vision was to start a family farm to get his family through life and to leave to his children,” Teri said. In the earliest days, he had just one product — 1-gallon container junipers. “He started out very small and mostly sold the product back to the people he had worked for,” Teri said. But the operation quickly branched out — both in terms of products and added space. William soon added laceleaf maples and additional grafted conifers, which were soon followed by fruit trees. He also began buying more land on which to grow them. “Once he left the five acres and expanded, he bought properties as they became available all around him,” Teri said. He eventually had 150 acres under ownership. Early on, he sent 200,000 fruit trees into California, many of which are likely still standing. “We’re really proud of that,” Teri said. It was a fun experience, but it was also hard work. In the summer, the Dillard kids were joined by neighbors and classmates who took summer jobs at the nursery. Teri feels they learned work ethic and habits that helped them succeed in life. After 30 years in business, William and Betty decided to turn the company over to their three children, “even though they were still a big part of it,” Teri said. This was different from when William owned it and called the shots. The three siblings learned the art of give and take, and how to compromise. “We’re into the fourth generation in 56 years, so we must be getting along all right somehow,” Teri said. Around this time, Teri became more involved in the Oregon Association of Nurseries. “My dad always encouraged us to be involved in what we did, so we could continue to learn,” Teri said. “My sister and I were girls in a man’s industry, so he encouraged us to get involved and make connections.” In 1991, Teri served as the OAN president for a year. Around the year 2000, the nursery embarked on a gradual expansion by leasing surrounding property. By 2009, the nursery was leasing 150 acres in addition to the 150 that it owned. The recession and market crash that began in 2008 brought the expansion to a halt. Making matters worse, in 2010, the nursery suffered a three-alarm barn fire that included the nursery’s offices. That same year, William passed away. Betty followed him in 2012. Due to these circumstances, the nursery had to scale back its ambitions as well as its workforce. “When you get through tough times, it makes you a stronger person, it makes you a stronger company, it makes you a stronger family,” Teri said. life lessons. Quit feeling sorry for yourself. Spend less than you make. If you break something, fix it. Never stop learning. And never quit. Having made it through the challenges of the last six years, the Dillards now find themselves in a good place.